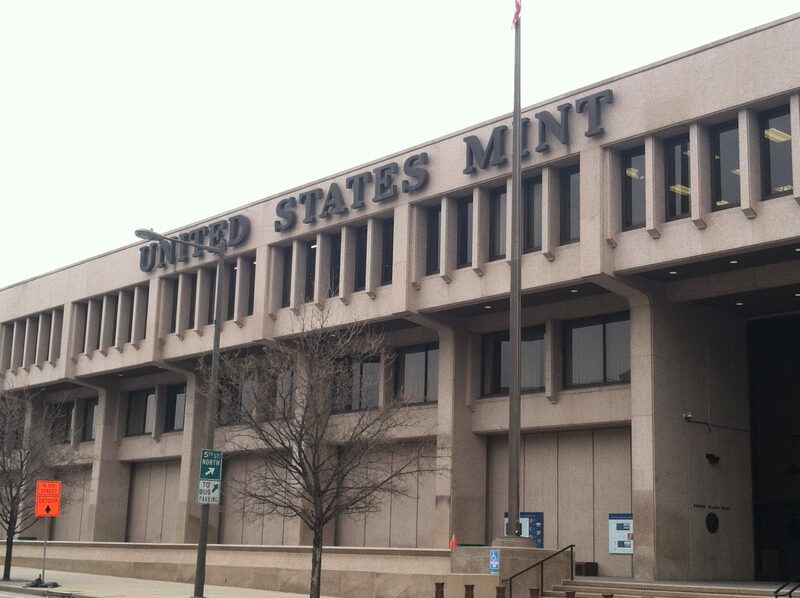 Located across the street from the Constitution Center and Ben Franklin’s grave, the United States Mint is one of the four mints operated by the United States Government. (The others are in Denver, San Francisco, and West Point, NY). The Philadelphia Mint is the oldest of the four, originally opened in 1792. The Brutalist building is one of the largest in the city, occupying an entire city block, between Arch and Race, 4th and 5th. Visitors to the Mint enter at the corner of 5th and Arch, where photo ID is required for entry. Upon entering the dimly lit, air-conditioned lobby, visitors can go to a mezzanine, where there are historic coins on display, as well as a timeline that compares the coins in your pocket to current events. Originals of all various commemorative coins are displayed, including coins honoring Dwight Eisenhower, Susan B Anthony, and others. There’s a small theater, named after David Rittenhouse, (as in Rittenhouse Square) that shows a short film on the debate over the establishment of a federal mint. This film has the silhouettes of actors in colonial attire, portraying the likes of Thomas Jefferson, Alexander Hamilton, and others. Afterwards, visitors take an escalator up into the factory, which can be viewed from various points. This is a completely self-guided tour, and does nearly a complete loop around the building. Signs and displays highlight the the process of coin production, where visitors can look down on the actual live production, and learn about what they are looking at. There are videos at some of these stations, narrated by legendary Phillies broadcaster Harry Kalas. It begins with the making of the designs on coins, and how they are sculpted. It then moves on to the assembly of the tools for striking coins, and molding them into their familiar shapes. At this point, conveyor belts carrying thousands of coins are visible, all of which will be sent into circulation soon. The stream of coins is both awe-inspiring and seemingly infinite. The coins are then heated, struck, and are then inspected to ensure “mint condition,” before being prepared to be sent to one of the 12 federal reserves around the nation. Visitors will receive a booklet that documents the process of coin production, which additionally serves as a souvenir. Admission, ironically, is free. However, visitors over the age of 18 must show photo ID, as security is tight. There’s a large gift shop near the entrance.